I'm finding myself wanting to be more healthy lately. What better way to start then searching out options the natural way instead of using chemicals or medicine. I find myself browsing the net when im bored looking for a "cure" to my pain. There is so much stuff out there, even i was overwhelmed. One of the things that stood out was Magnesium. You can get Magnesium in different products, like Bath flakes and oil. With the consistency of an oil, this topical magnesium is designed to hold the mineral on the skin for transdermal absorption and will penetrate for effective cellular supplementation. Provides measurable relief from muscle tension, muscle ache and muscle pain resulting from magnesium deficiency. Each 8oz (237ml) bottle of Transdermal Magnesium Chloride Liquid (Oil) is estimated to deliver 120mg of magnesium per undiluted millilitre. Full-strength: Pour 1 ounce (29.5ml) of magnesium oil in a tub or footbath. Half-strength for direct skin application: Dilute at least half-strength with distilled water and spray directly on skin and massage. Massage: Rub into sore muscles to relieve the pain. Hot Compress: Ideal for tight, tired muscles. Rub the Magnesium Liquid (Oil) into the area. Take a small towel and wet it in hot water (as hot as comfortable). Place over sore area and allow the heat of the compress to drive the magnesium into the skin. When the compress cools, repeat. Also, apply to legs before bed to relieve restless legs. My Husband an i had to try this out, both suffering from chronic pain, fed up with chemical and in my case narcotic medicine, we opted to try something new. 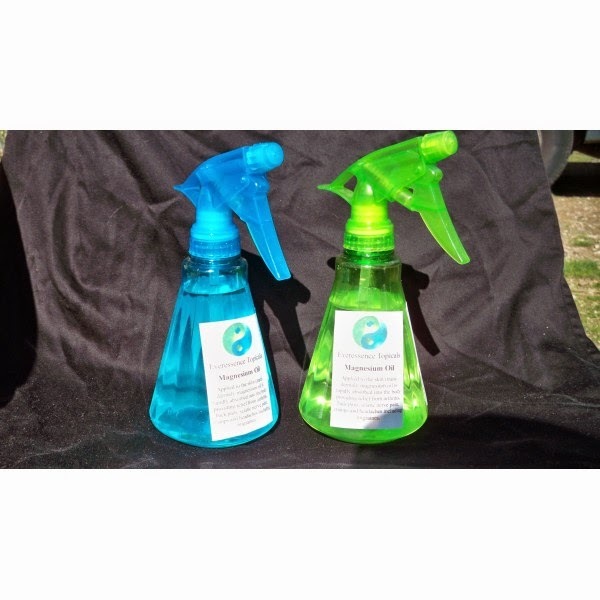 with Everessence we got a spray bottle of Magnesium oil, its very oily and soaks in fast. small amounts go a long way. We ordered the 12 oz. Large Pain relief topical spray. I have sensitive skin and found in some areas it felt like my skin was burning, one of the first things we did was dilute it with DISTILLED water. After about 3 separate applications on my knees i started noticing that i wasn't having to grab and sooth them as much, the pain is still there but it went from 9 (10 being highest) to about a manageable 6. The extream almost untolerable pain has subsided since the use of the oil daily. I might as well review the Magnesium Salt bath while Reviewing the Magnesium Oil. We are AVID users of epsom salt baths, and since we were looking for more healthy ways to manage pain we decided to get the magnesium flakes for the bath.We wanted to have the added benefit of having and controlling how much Magnesium we are adding to the bath. According to the Epsom Salt Industry Council, a simple soak is beneficial to heart and circulatory health, can lower blood pressure, helps ease muscle pain and eliminates harmful substances from the body. It also improves nerve function by encouraging proper regulation of electrolytes. Soak in epsom salts 2-3 times weekly for general health maintenance or to alleviate the discomfort of bruising and sprains. 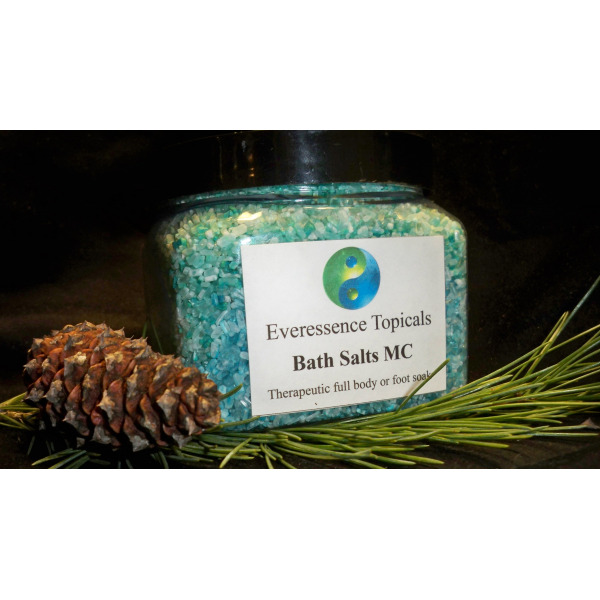 An epsom salts soak also encourages detoxification of drugs remaining in the body after surgery. What are the Benefits of Magnesium Bath Flakes? Overall i love the products they work for us and they are GOOD for your body.